Kabbaz-Kelly is an American brand based in New York and founded by Alexander Kabbaz and Joelle Kelly in the 1970’s. They make bespoke shirts and sell a wide range of socks and underwear (sometimes under their own brand). Kabbaz-Kelly ready-to-wear boxer shorts are designed by Alexander Kabbaz and made in Italy by Villa Delmitia; besides, you can purchase made-to-order boxers manufactured in the USA. 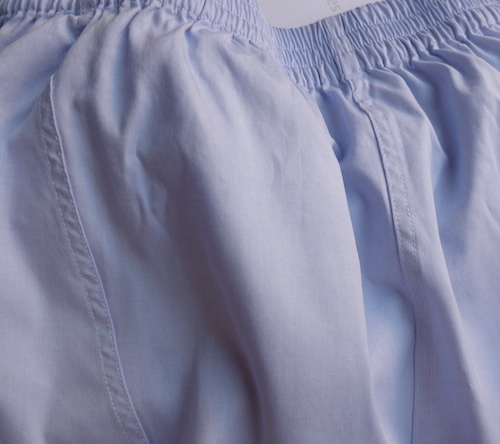 These boxers feature inserted back panels with double-stitched seams (5 stitches per 1 cm.) 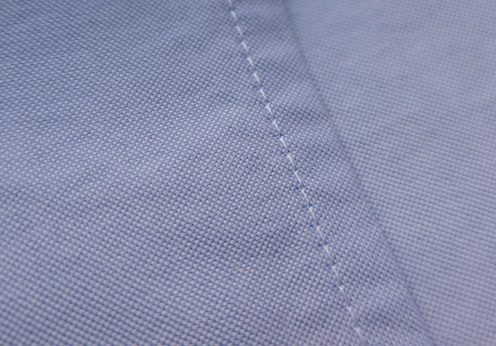 and waistbands with several rows of stitching (these are not the best waistbands, but according to my experience, they’re more comfortable than similar ones on Derek Rose boxers, for example). 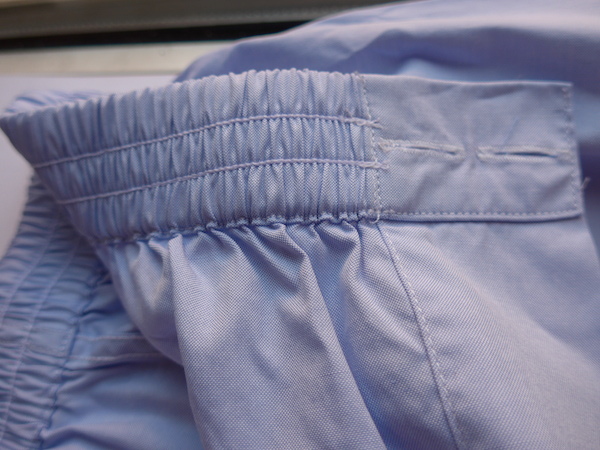 Made-to-order boxers can feature closed front waistbands without buttons. Kabbaz-Kelly ready-to-wear boxers are equipped with flawless mother-of-pearl buttons (by Gritti, 2,5 mm. thick, laser-engraved), but they’re sewn on without shanks. Buttonholes are a bit too small for these large buttons. 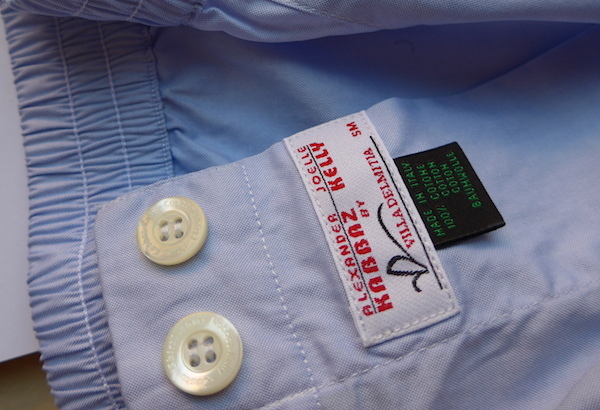 It must be added that Kabbaz-Kelly made-to-order boxers are equipped with hand-sewn buttons. Kabbaz-Kelly ready-to-wear boxers are made of high quality Alumo fabrics (genuine 2-ply (2×2), 100s, 120s, 170s, extra-long staple Egyptian cotton, made in Switzerland, Oeko-Tex Standard 100). They’re available in white, charcoal, powder blue, French blue and blue colours (weaves: voile, broadcloth). There’re much more fabrics available for made-to-order boxer shorts (Italian- and Swiss-made; patterns: checks, stripes, paisley, fancy, camo…) Sizes: XS (Made-to-order only), S, M, L, XL, XXL, XXXL. Please note that Kabbaz-Kelly boxer shorts are cut quite roomy and long (in comparison with Derek Rose, Emma Willis and Berg & Berg boxers, for example). You can buy / order them at CustomShirt1.com. Prices start at 69 USD (no VAT). These boxers are sold in plastic gift boxes. As far as I know, they’re never put on sales. This entry was posted in Boxers, Italy, Switzerland, United States by Dmitry_Vasfilov. Bookmark the permalink.